Aluminum screen door color choices are expanding these days. Used to be that just about every door was white or mill finish. Those colors still represent most of the screen door kits I sell. 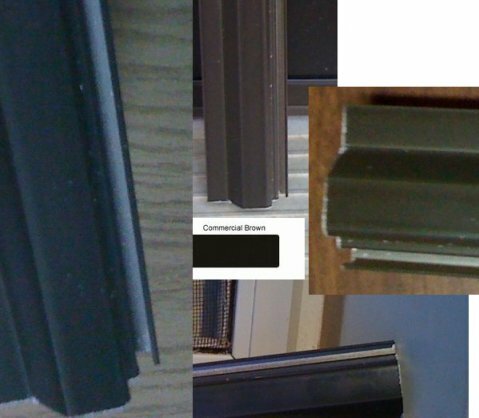 The basic colors for my screen door kits are white, mill finish and brown. Mill finish is just the bare silver aluminum colour. These three colors are used by most manufacturers of windows and doors so the kit door will very likely match the finish you have now. Colors dont always come through well over the internet but at least these images should give you an idea of how the colors look. Dont hesitate to ask me if you need additional pictures. The collection of pictures above are all the same color - bronze. But taken in different light conditions. Some inside, some outside. The three colors above are kept in stock, the colors below may not always be available because they are less popular. They are materials left over from large custom color orders. If these colors interest you please check with me to make sure they are available. This is sometimes called "Commercial Brown", its darker than the regular brown frame and has a matte or non shiny finish.